Cambria Evans Christensen is an author and artist of children’s books. She was born in Richmond, Virginia, and grew up in Provo, Utah. 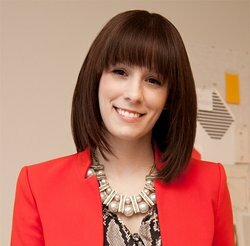 She studied graphic design at Rhode Island School of Design and works as a designer, illustrator, and writer. Her book titles include Bone Soup, and Martha Moth Makes Socks. She illustrated Part-time Princess and titles in the Stuey Lewis series: The One and Only Stuey Lewis: Stories from the Second Grade and Stuey Lewis Against All Odds: Stories from the Third Grade. She worked as an art director for Martha Stewart and has done design work for L. L. Bean, Habitat for Humanity, Reader’s Digest, and Kmart. Her husband, Kari Christensen is also an illustrator. She is a member of The Church of Jesus Christ of Latter-day Saints. This page was last edited on 24 May 2016, at 21:18.